UK environmental law has been heavily influenced by EU membership, and Brexit presents both opportunities and challenges to its long-term development. In the immediate future the substance of much of existing EU environmental law will continue to have legal effect in the UK after Brexit under the Government’s policy of ‘roll-over’. But it has become increasingly clear that other features of the EU environmental architecture will need to be replicated after Brexit—notably the role of general environmental principles, and the European Commission’s supervisory role in ensuring that environmental law is properly applied by government. Richard Macrory is emeritus professor of environmental law at the Faculty of Laws, University College, London. In 2017 and 2018 he was co-chair of the UK Environmental Law Association’s Brexit Task Force. At the time of writing, the outcome of the United Kingdom’s BREXIT arrangements remains uncertain. Nevertheless, whatever the precise details of any agreement (or even lack of agreement) it is possible to predict at least some of the immediate impacts of Brexit on UK environmental law. In common with many EU Member States, national law and policy has been heavily influenced by the environmental legislation of the European Union over the past thirty years or so. EU membership has affected not simply the substance of UK environment law, but has brought profound changes to the style and character of its legislation.1 The UK has a long history of environmental law and regulation stretching back to the industrial revolution in the nineteenth century, but prior to membership of the EU, national environmental legislation was typically very detailed in procedural requirements (the need to obtain licenses for specified activities etc.) but frequently was silent as to policy goals which were left to government to determine. Similarly, the details of emissions standards and similar requirements were often left to the discretion of regulatory bodies to determine within the broad framework of environmental legislation, or in accordance with policy guidance set by government. The need to implement EU environmental legislation has substantially changed these long-standing characteristics of UK environmental law. Precise emission standards, detailed environmental quality objectives, and target obligations derived from EU law now permeate national law. A good example concerns drinking water standards. For many years, the standard in national legislation was simply one of supplying ‘wholesome water’.2 In practice, public bodies supplying water often used World Health Organization and international similar standards to flesh out this flexible legal phrase. But legislation since 1980, implementing the EC Drinking Water Directive,3 now contains a set of precise standards within the body of the law and reflecting those in the Directive.4 These characteristics are now so entrenched in the body of environmental law that, whatever changes take place in the longer term as a result of Brexit, it is unlikely that there will ever be a substantive return to the pre-EU style of legislation. Many EU environmental regulations and national law implementing directives will therefore continue to have legal force immediately following the UK’s exit from the EU. But there are clearly some examples where the substantive law is so intimately bound into EU institutional arrangements that simple roll-over is not possible unless specific agreements with the EU are made. Good examples are the EU emissions trading regime for greenhouse gases,10 and the EU Regulation of chemicals (REACH).11 A good deal of national environmental legislation now contains cross references to EU law. For example, the Environmental Permitting (England and Wales) Regulations 2016 defines a waste battery as having ‘the meaning given in Article 3(7) of the Batteries Directive, but do not include any waste which is excluded from the scope of that Directive by Article 2(2)’.12 Even though the Directive will have no independent legal force in the United Kingdom after Brexit, there seems no reason why such definitional references cannot continue—it would be similar to having a reference in legislation to a definition in an OECD or similar international document. In contrast, some EU Regulations and national legislation implementing containing references to the requirement to notify or consult the European Commission, and clearly these can no longer apply after Brexit and another body, such as the Secretary of State, will need to be substituted. It is therefore clear that in order to ensure that retained EU law remains operable, there is a considerable task of detailed amendments that will be necessary, even if the core substantive obligations remain. In September 2017, the Secretary of State for Environment, Food and Rural Affairs told Parliamentarians that there were around 850 pieces of legislation within his Department’s responsibility that would require amendment.13 Most of these concern animal and plant health and agriculture, with about a quarter in the environmental field. The issue will cover all areas of national law affected by EU legislation, and to allow for this scale of amendments to be made in the time-scales required and without overloading Parliament, the European Union (Withdrawal) Act 2018 has given government broad powers to make regulations considered ‘appropriate to prevent, remedy or mitigate—(a) any failure of retained EU law to operate effectively, or (b) any other deficiency in retained EU law, arising from the withdrawal of the United Kingdom from the EU.’14 The term ‘Deficiencies’ is further defined to include, inter alia, ‘retained EU law that contains anything which has no practical application in relation to the United Kingdom or any part of it or is otherwise redundant or substantially redundant’. The scope of the discretion caused some concern during the passage of the Act through Parliament, but it is important to note that the legislation provides any such failures or deficiencies must arise out of Brexit. A government that was, for example, unhappy with the strict requirements of the Habitats Directive15 could not use these powers to amend the implementing regulations since they would not be ‘deficient’ in those terms. The European Union (Withdrawal) Act 2018 also deals with the legal status of decisions of the CJEU. Decisions made by the CJEU after the UK’s withdrawal from the EU will no longer bind the UK courts, nor will courts have any power to make references to the CJEU. In practice, the national courts are likely to have regard to post-Brexit decisions of the CJEU where, say, it is interpreting a term that appears in retained EU law, but they will not be bound to follow them. As for existing decisions of the court, the Act introduces a neat balance designed to maintain a degree of regulatory certainty but allowing some flexibility. The lower courts will continue to be bound by decisions made by the CJEU prior to Brexit, but the highest court, the Supreme Court, will have the discretion to depart from such decisions. But the Act states that it should only do so in line with its own practice of rarely departing from its own previous decisions.18 To take a recent example, in People over Wind and Sweetman v Collite,19 the CJEU held that mitigation measures could not be taken into account when assessing whether a project was likely to have significant environmental effects under the Habitats Directive. This decision was contrary to previous decisions on the same point taken by the British High Court and Court of Appeal. Post Brexit, this decision will continue to bind the lower courts dealing with the national Habitats regulations,20 but if the issue ever reached the Supreme Court it could decide not the follow the ruling of the CJEU. Alternatively, the government post Brexit would have the power to amend the legislation should they wish, subject to the constraints that may be contained in any withdrawal agreement made between the EU and UK. The European Union (Withdrawal) Act provides that retained EU law is to be interpreted in accordance with ‘retained general principles of EU law’, provided it was recognised as a general principle by the CJEU before the date of departure from EU. However, the Act excludes any rights to claim damages under the rule in Frankovitch after exit, and the Charter of Fundamental Rights is expressly declared not to be part of domestic law once the UK leaves the EU. The environmental principles contain in Art. 191 TFEU are not considered to be general principles, and their role and status post Brexit has given rise to considerable political debate during the passage of the European Union (Withdrawal) Act in Parliament. The environmental principles are often mentioned in the preambles of Directives, but it is generally only the substantive provisions of directives, rather than the preambles, that are transposed into domestic law. This did not mean that the environmental principles would have been totally excluded from domestic law post Brexit. First, EU Regulations will continue to have force as retained EU law, and this appears to include their preambles. Secondly, decisions of the CJEU prior to Brexit and applying the environmental principles to the interpretation of EU environmental law will continue to bind the lower national courts in accordance with the provisions of the European Union (Withdrawal) Act described in Sect. 2.3 above. The Government recognised that environmental principles could play a useful role post-Brexit and in May 2018 launched a consultation document on the possible role of environmental principles after Brexit.23 As the document stated, ‘We believe it will be beneficial to underpin environmental regulation and policy-making with a clear set of principles.’24 But the consultation document deliberately left open for discussion a number of broad questions—in particular what environmental principles should be included? Should they be expressed in legislation, or should they be contained in a Policy Statement explaining how they should be interpreted and applied? The consultation did not end until August 2018, but to a certain extent these open questions were overtaken by political events. During the passage of the European Union (Withdrawal) Act, the House of Lords passed an amendment, initiated by environmental NGOs, designed to incorporate the EU principles into UK law post-Brexit. The Government recognised that the issue now had considerable political support, and proposed a counter-amendment which was passed by the House of Commons.25 This now provides that a set of environmental principles must be contained in legislation, but gives the Government rather more discretion in the legal role that they will play in future. Other principles could be added26 and many interest groups have suggested additional principles such as the non-regression principle. As to the status of these principles, section 16 goes on to provide that the new Bill to be produced by Government must impose a duty on the Secretary of State to produce a policy statement in relation to the application and interpretation of these principles in connection with the making of policy by Government, and a duty to ensure that Government ministers ‘must have regard to’ these principles in circumstances provided for under the Bill. Clearly this still leaves considerable leeway for the Government, and it is likely that there will be pressure in Parliament during the passage of this new Bill during 2019 to strengthen these requirements. For example, many environmental NGOs argue that they should apply beyond central Government but to all public bodies making environmental decisions. Similarly, there will be pressure to strengthen the wording, ‘have regard to’, (which legally implies that while they must always be considered they can be ignored in any particular circumstance) to a duty to apply these principles in all decision-making. One of the functions of the European Commission is to ensure that Member States properly implement their EU obligations, and Art. 258 of the TFEU gives the Commission a distinctive set of enforcement procerus which can eventually lead to action before the CJEU. These enforcement powers have been applied in all areas of EU law but the Commission has long been especially active in the environmental field—in 2015 the highest number of infringement proceedings concerned EU environmental law.27 There are reasons for this. In many fields of EU law such as employment, intellectual property and completion law, there are clear legal and economic interests who can be expected to ensure that their rights under EU law are properly protected. There is generally no equivalence of rights and private interests in the environment. Governments and public bodies in most jurisdictions have therefore been given distinctive responsibilities under national law for ensuring environmental protection, but it is often these bodies who are often faced with conflicting policy priorities and financial constraints, making the environment especially vulnerable. Environmental NGOs and other interest groups do of course play an important role in helping to ensure compliance with environmental law but cannot be expected to shoulder all the responsibilities for so doing. Part of the Commission’s supervisory role is to ensure that EU Directives are properly transposed into national law, but equally a breach of environmental law by a Member State in practice is considered a failure of its EU responsibilities. In this context, actions can be taken not just in respect of central government but any failing by an emanation of the state such as a local authority and a national environmental agency can also be considered a failing by the Member State concerned. In dealing with breaches in practice, the Commission does not have its own inspectorate within Members States, but has a developed a citizens’ complaint procedure allowing anyone at no cost to alert it of possible breaches. This can then trigger the Commission to seek further information from the Member State concerned, and leading to possible infringement proceedings. Much of the European Union (Withdrawal) Act 2018 is concerned with the ‘roll-over’ of substantive EU law, but after Brexit, the European Commission will no longer have a supervisory role under Art. 258 TFEU. When this governance gap was pointed out to government by parliamentarians in 2017,28 the initial response of the then Secretary of State for Environment Food and Rural Affairs was that existing judicial review procedures were adequate to ensure the legal accountability of government and other public bodies. It is true that the national courts have generally adopted a very liberal approach to questions of standing in environmental judicial reviews, with the result that almost any environmental organisation or concerned citizen will be permitted to bring a claim. But judicial reviews in the UK take place in the High Court and are resource intensive, and normally involve legal representation. Generally, the side that loses must pay the winning side’s legal costs, and although, as a result of the Aarhus Convention, there are now statutory upper limits of the exposure to adverse costs orders,29 the financial resources and risks involved in judicial review remain considerable. Perhaps more importantly, it is clear that the European Commission attempts as far as possible to resolve infringement proceedings by negotiation and discussion—a very small proportion of cases ever reach the CJEU. Judicial review procedures, in contrast, are ill-suited to resolving issues in this way—once legal action is started it is rare for a case to settle before the court hearing, unless the weakness of one side’s case becomes obvious. A number of important issues remain to be determined. First, as drafted, the provision only concerns breaches of environmental law by Ministers of the Crown (i.e. Central Government). It is clear that breaches by other public bodies should be within the jurisdiction of the new body. The simplest way of doing so would be to extend its powers and allow it to take enforcement action directly against local government and other public bodies as well as central government. An alternative model, which would more closely replicate the current enforcement role of the Commission, would allow the new body only to take action against central government but in respect of any breaches of law by any public body—an extended notion of responsibility which would be novel in conventional public law terms. But as the response of the UK Environmental Law Association put it, ‘this approach ensures that Central Government cannot duck its responsibility to take steps to address the breach of environmental law by arguing that this is a matter for local government or some other public body. It would have to provide a convincing response to show that it is addressing the issue or default’.31 It is very unlikely that the new body will investigate and take action in respect of all environmental law breaches, but will be selective and strategic in its approach, only bringing action in the most serious cases. In those circumstances, it is not unreasonable that it should be central government that must sort out the problem, even if it was not the immediate cause of the breach. The new body will undoubtedly try to resolve issues without the need for formal legal proceedings in much the way that the Commission does at present. But where proceedings are taken, another important issue to be determined is the power of the courts. Failure to comply with a judgment of the CJEU can lead to substantial financial penalties being imposed by the court under Art. 259 TFEU. In the environmental field, such penalties have been imposed on a number of Member States since 2000, and although the United Kingdom has yet to receive a penalty, the existence of such powers have undoubtedly focussed the minds of government. If one were to replicate the EU procedures in a national context, the new body would have power to serve a compliance notice. If this is confirmed by a court, and still not complied with by government, then the new body could seek a financial penalty from the court. But where central government was involved, some method of ring-fencing the penalty would be needed, otherwise it would simply be recycled with government. Others have argued that such explicit powers of penalty are not required, unless for totemic or political reasons. The failure of a government or other public body to comply with the judgments of a court in judicial review actions in any event is a contempt of court, and the courts have inherent powers to fine, sequester, in even imprison those responsible. In practice, it is very rare for a government or public body to fail to comply with a clear order of a court. Until the terms of the new Environment Bill are clear (probably end of 2018 or early 2019), the Government’s view on these issues will not be known. There are a number of questions concerning the relationship of the UK with such bodies after Brexit. First, as a non-member-state, do the relevant rules permit the United Kingdom to remain a member? For example, non-EU countries can be a member of the European Environment Agency.34 There would be considerable benefits for the UK to remain a member of the EEA but under the present Regulation this would require an agreement to be reached between the EU and the UK, and the acceptance of the jurisdiction of the CJEU concerning contractual and other liabilities of the Agency. In contrast, the rules establishing the European IPPC Bureau allow membership of only Member States, and international organisations representing industries and non-governmental organisations.35 The current constitution of the European Union Forum for Judges for the Environment allows membership only of judges of the CJEU, the European Court of Human Rights, and judges of an EU or EFTA Member State. The UK has ratified over forty international environmental treaties, and Government has several times stated that it remains committed to its international obligations post Brexit. But leaving the EU does raise some legal issues as to the extent of these obligations, because the EU has participated in many of these treaties. There are some such as the International Whaling Convention 1946 where the EU had no legal competence and the UK has ratified on its own. These obligations clearly continue after Brexit. On the other hand, there are areas, notably in fishing, where the EU has had exclusive competence to ratifying, binding the Member States in so doing. Here the UK will no longer be bound by these agreements unless it makes a conscious decision to ratify. But the vast majority of international environmental conventions are so called mixed agreements where both the EU and Member States have ratified because their competence straddle the subject matter of the Convention in question. Here the legal position is not entirely certain. Some have argued that after Brexit these will no longer bind the UK unless, as with exclusive agreements, it decides to ratify in its own right.37 An alternative and probably more convincing analysis is that on Brexit the UK assumes all the competences formally held by the EU and is automatically bound by the full extent of these mixed international agreements. Simple notification to the relevant secretariat that it has assumed all the responsibilities is all that is required. The UK Government’s view of the legal position of mixed agreements is not yet known. But assuming that the UK does continue to be bound by all the international environmental agreements which it has ratified, this does not mean that the legal situation remains the same after Brexit. Many international agreements have been implemented by EU Directives and Regulations, and it is these instruments which have had direct legal force within the national system. Some of these have fleshed out requirements of the international convention or extended their ambit within the EU. A good example is the regulation on transfrontier shipments of waste38 implementing the Basel Convention.39 The Basel Convention is confined to hazardous waste whereas the EU regulation covers both hazardous and non-hazardous waste. In the immediate post-Brexit period, the EU regulation will be ‘rolled-over’ into UK law, but in the future government could decides to amend the national law and confined itself solely to the requirements of the Convention in question. The Government’s initial position on EU environmental law post Brexit has been that its requirements will initially be rolled over as far as possible into national law in order to provide legal stability and certainty. It is a technically complex task but achievably in most areas. Even decisions of the CJEU before Brexit will continue to bind the lower courts after the UK leaves the EU. ‘Roll-over’, however, is essentially concerned with the black letter of substantive law, and during the last two years it has become increasingly clear that there are significant aspects of the existing architecture of EU environmental law which are not dealt with by roll-over, and unless steps are taken would disappear after Brexit. Two notable examples are the role of EU environmental principles, and the supervisory role of the European Commission in ensuring that Member States comply with their EU obligations. To its credit, the Government has acknowledged the importance of replicating these features in national environmental post-Brexit, though the precise details as to how this will be done are not yet known. Similarly, the UK has been a participant in many European bodies and networks concerning the environment, both formal and less formal, and the extent to which it will continue to do so and on what basis remains a challenge. Finally, the UK has long been an active supporter of international environmental conventions, and remains committed to continue to do so in the future. The precise extent of its international obligations post Brexit where the EU has participated in such agreements still remains a little unclear. But it seems likely that post Brexit international environmental law will assume both greater political and legal significance. On the political side, there is a degree of irony that one of the leading Brexiteers was appointed Secretary of State for Environment, Food and Rural Affairs in July 2017, and to the surprise of many environmental organisations has since pursued a bold and radical approach to environmental policy and law. A new 25 plan to improve the environment was published in January 2018 setting out ambitious proposals for the longer term post-Brexit.41 A month later, the Secretary of State launched a bold consultation paper to reform agricultural policy, ensuring that subsidies post Brexit went only for environmental and other land improvements.42 There is little doubt that is some areas such as agriculture and fisheries, a national government could implement more radical and environmentally sensitive policies quicker and more effectively than is possible within the EU. But this is dependent on national political leadership, and changes in government or even a move of ministers could equally lead to a lowering of environmental priorities, especially in the light of economic challenges post Brexit. The constraint of EU environmental law has to date provided a minimum set of legal standards to which all Member States are bound, and this legal bedrock will disappear after Brexit. Hence the importance of the terms of any agreement reached between the UK and the EU on Brexit concerning the maintenance of existing environmental standards. In the absence of such an agreement, international environmental law will assume far greater significance than has hitherto been the case. Brexit involves many uncharted legal waters. The extent to which it provides opportunities for the UK to enhance or degrade its environmental law remains to be seen. S 115 Public Health Act 1936. Now Directive 98/83/EC of the Council of 3 November 1998 on the quality of water intended for human consumption  OJ L 330/32. For current standards see Water Supply (Water Quality) Regulations 2016/614. Department for Exiting the European Union , p. 17. S 5(2) European Union (Withdrawal) Act 2018. S 5(1) European Union (Withdrawal) Act 2018. S 4(2) European Union (Withdrawal) Act 2018. Directive 2003/87/EC of the European Parliament and of the Council of 13 October 2003 establishing a scheme for greenhouse gas emission allowance trading within the Community and amending Council Directive 96/61/EC  OJ L 275/32. In March 2018, the Minister for Energy and Clean Growth told Parliament that it was the UK Government’s intention to stay within the EU Emissions Trading Scheme until the end of Phase 3 in 2020. Regulation 1907/2006/EC of the European Parliament and of the Council of 18 December 2006 concerning the Registration, Evaluation, Authorisation and Restriction of Chemicals (REACH)  OJ L 396/1. Environmental Permitting Regulations 2016, reg 2. Letter from the Secretary of State to Chair, House of Commons Select Committee on Environment, Food and Rural Affairs. This figure does to include EU environmental legislation that falls within the remit of other departments, and the total will therefore be higher. S 8(1)European Union (Withdrawal) Act 2018. Directive 92/43/EEC of the Council of 21 May 1992 on the conservation of natural habitats and of wild fauna and flora  OJ L 206/7. Named after extensive powers to given to Henry VIII (1509–1547) under the Statute of Proclamations 1539. UK Environmental Law Association . In 1966 the Judicial Committee of the House of Lords, the predecessor to the Supreme Court, stressed the importance of binding precedent providing certainly in law but for the first time indicated that too rigid adherence to precedent could lead to injustice and that in future, while it would normally treat its previous decisions as binding, it would be prepared to depart from them ‘when it appears right to do so’: House of Lords Practice Statement (Judicial Precedent)  1 W.L.R. 1234. In 2010, the Supreme Court held that this Statement was still applicable to the Supreme Court: Austin (FC) v London Borough of Southwark  UKSC 28. Conservation of Habitats and Species Regulations 2017/1012. Department for Environment Food and Rural Affairs . Where the House of Lords passes amendments to Government proposed legislation with which the House of Commons disagrees, the proposed legislation may go back and forth many times between the Lords and the Commons until agreement is reached—known as ‘ping pong’. In this case, the House of Lords, while noting that the Commons amendment on environmental principles did not go as far as they wished, withdraw its own amendment. See, for example, House of Lords : ‘The evidence we have heard strongly suggests that an effective and independent domestic enforcement mechanism will be necessary, in order to fill the vacuum left by the European Commission in ensuring the compliance of the Government and public authorities with environmental obligations. Such enforcement will need to be underpinned by effective judicial oversight, and we note the concerns of witnesses that existing domestic judicial review procedures may be inadequate and costly.’ (para. 84). Under the Civil Procedure Rules, Part 45, in an Aarhus claim, a losing claimant may not generally be order to pay costs of the other side of more than £5000 (where the claimant is an individual) or £10000 (where the claimant is a company or organisation). A winning claimant may not normally be able to claim for than £35000 in legal costs. S 16(d) European Union (Withdrawal) Act 2018. See for example, Scottish Roundtable on Environment and Climate Change . The report notes that, ‘having a Scottish body with a thorough understanding of Scottish law, procedures and systems would be more focused on the issues that are most significant in a Scottish context. Scotland is of a scale at which we can envisage a separate body being justifiable and effective. However, we suggest that consideration be given to how arrangements might best work across the UK to allow collaboration, comparisons, efficient use of expertise and promotion of best practice.’ (para. 5.16). Art. 19 of Regulation 2009/401 of the European Parliament and of the Council of 23 April 2009 on the European Environment Agency and the European Environment Information and Observation Network  OJ L 126/13 provides that ‘The Agency is open to countries which are not members of the Community but which share the concern of the Community and the Member States for the objectives of the Agency under agreements concluded between them and the Community following the procedure in Article 300 of the Treaty’. Decision 2011/C 146/03 of the Commission establishing a forum for the exchange of information pursuant to Article 13 of the Directive 2010/75/EU on industrial emissions  OJ C 146/3 allows EEA members such as Norway to attend meetings of the forum. HM Government , p. 8. 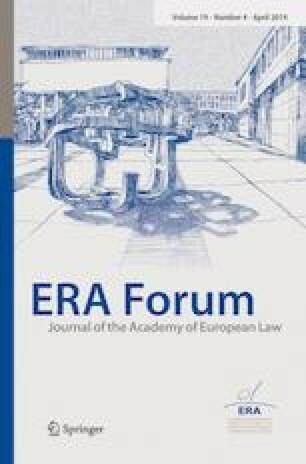 Van de Loo and Blocksman ; the authors argue that a protocol would be needed for each agreement agreed by the EU27 and other third country parties to the agreement. Regulation 1013/2006 of the European Parliament and of the Council of 14 June 2006 on shipments of waste  OJ L 190/1. Basel Convention of 22 March 1989 on the control of transboundary movements of hazardous wastes and their disposal, United Nations, Treaty Series, vol. 1673, p. 57. In a recent decision of the Supreme Court concerning discrimination law, one of the judges suggested that where the UK had signed an international convention concerning human rights which had not been implemented into national law, the strict dualist approach should be ignored, and the Government be held bound by its international obligations by the national courts. He was in the minority, but this could be a pointer to the future. See R (on the application of SG and others) v Secretary of State for Works and Pensions  UKSC 16. Department of Environment, Food and Rural Affairs .